They say “a picture is worth a thousand words”. So, at 24 frames a second, a 2 minute video is worth 2,880,000 words. Every year, parents pile into schools to hear about the subjects on offer. Teachers speak to large groups of parents and students about what the subject is, then everyone goes home. At my school, every head of faculty makes a subject selection video which parents and students can watch in the comfort of their own home. Slightly more arty than most. We still have subject selection night. We just use that face to face time differently. Parents and students come in and have conversations with our staff, having their specific questions addressed. It seems strange that often in schools teachers all undertake the same professional development. Given the diversity of teachers, any blanket PD is very unlikely to cater to all teachers. Instead, why not use video to provide on-demand professional development to staff. I recently implemented “tech tip tuesday” emails at my school. An email to all teachers with a short, 3 minute tech tip. Teachers can choose when and whether they watch it. If they do choose to watch them, over the course of a year that’s an “incidental” 2 hours of PD! As teachers, when we hand out assignment pieces, often we spend quite a bit of time going through, as a class, exactly what is being asked of us. Why not record your assignment explanation. Students can refer back to it later in the assignment to make sure they fully understand the task, parents can view it and students who may have been sick on “hand out day” can also watch the video. Often, great care needs to be taken when writing an email to parents. We need to be careful with the wording, making sure that what we are trying to say is being perfectly conveyed by the words we type. Why not make them a video. You can convey a lot with your facial expression and tone of voice that just isn’t possible in an email. Sometimes you’ll get an email from a student, parent or fellow teacher asking for technical assistance. Maybe they can’t figure out how to login to something or can’t find the correct sequence of things to click on a website. Do you have a lesson that you teach over and over, year after year. For instance, every english teacher has taught TEEL/PEEL paragraphs perhaps more often than they care to remember. Then just when you think you’ve nailed it a student asks, “what’s a TEEL” paragraph? If you’ve scheduled a meeting with an individual or a small group to propose something to them, or to report on something, consider sending them a video of your proposal/report in advance. This means that in the meeting, everyone can start discussing the proposal productively, rather than hearing it for the first time. A meeting is much more productive if everyone is on the same page before it starts. Are your staff meetings collaborative events? Or are they “chalk and talk”, with one person standing up the front transmitting information. If they are the first type, good for you. If they are the second type, consider cancelling the meeting and sending a video instead. I’ve discussed this one before in a previous blog post (Flipped Feedback) But basically you’ve got two choices. Red pen on a page, or a short video explaining exactly what students have done well, and how they can improve. Seems like a no brainer to me. 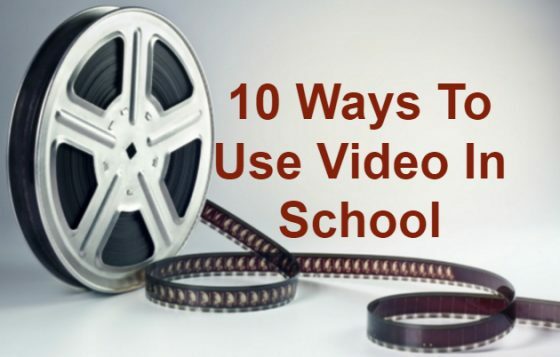 So, how could you use video in your school? Why do classrooms have fronts? Flipped Learning: What if they don’t watch the video? Great post on incorporating movie making into curriculum. My learners greatly enjoyed a movie/video making interdisciplinary course this past year. Great way to engage learners who have difficulty writing out their stories, but can visualize them so clearly. Powtoon, iMovie, animoto and storyboardthat.com were just a few tech tools I used. Thanks so much for sharing!